El Pollo Loco has introduced their new Grilled Chicken Nachos. The nachos feature tortilla chips topped with refried beans, Poblano Queso sauce, and shredded Jack & Cheddar cheese, citrus-marinated flame-grilled chicken breast, Pico de Gallo, sour cream, guacamole and sliced jalapenos. “Prior to our launch of Grilled Chicken Nachos, I can’t recall a time when consumers have had the opportunity to enjoy authentic, restaurant quality nachos at a fast-food eatery,” said Karen Eadon, chief marketing officer for El Pollo Loco. An order of Grilled Chicken Nachos has 1,150 calories, 57 grams of fat, 20 grams saturated fat, 109 mg cholesterol, 2,439 mg sodium, 98 g carbs, 13 g fiber, 7 g sugar, 28 g protein. Yes, 57 grams of fat! That's equal to 8 McDonald's Hamburgers or 4 Big Macs! And 2,439 mg of sodium? That's more than the NIH recommends for a whole day's intake. 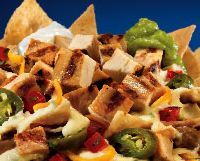 So you'd better split these nachos with a friend, but as it says on El Pollo's web site: "El Pollo Loco’s new Grilled Chicken Nachos are large enough to share, but you probably won’t."